Microorganisms settle on wet surfaces and over time form a biofilm there. 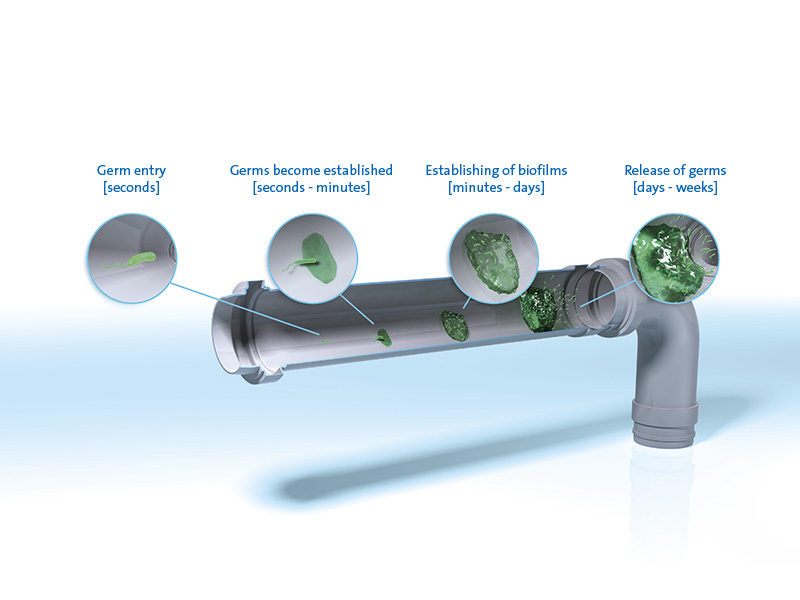 After several days, a biofilm can have already reached its stationary phase when continuous release of germs takes place. The purpose of an air humidification unit is to add moisture to the air — or more accurately, to increase the relative air humidity. To achieve this, the air is enriched with water. If adiabatic humidification systems are used, the question of whether water is added to the air by spraying, nebulization or evaporation is initially of secondary importance. The key point is that the water must be of hygienically good quality. 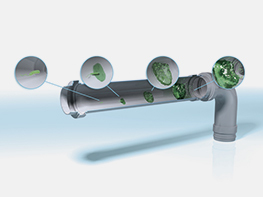 Therefore, VDI 6022 Sheet 1 (official draft) specifies: “The water supplied to the humidifier must meet the microbiological requirements of the German Drinking Water Ordinance.” One essential factor here is the need to prevent biofilms from forming in the water pipes. The safest choice for humidification purposes is actually to use drinking water. Drinking water, spring water and mineral water are not entirely free from bacteria, however. While this water obviously must not contain any pathogenic bacteria, molds, viruses or protozoa (Giardia), even a maximum of 100 bacteria per ml are already a clear indication of bacterial activity. Vaporizing these bacteria together with the water should not pose any risk to health or safety. However, if piped water, drinking water or tap water is sprayed directly, the lime and salt deposits which have built up in the pipe system will eventually need to be chipped out of the pipes. In addition, the deposits that form in wet areas provide the perfect living conditions for the micro-organisms that naturally occur in the drinking water. These micro-organisms can form colonies that can often grow to considerable size. Any lime or salt content must therefore be removed from the water used for humidification. However, the very treatment systems that are used to achieve this often favor the formation and growth of microorganism colonies. Bacteria in water supply systems generally appear in one of two different states: freely circulating in the water, or fixed in a so-called biofilm. Embedded in slimy, viscous, stringy extracellular polymer substances (EPS), the microorganisms that reside in a biofilm take up residence on any moist surface. In semi-conductor technology and the pharmaceuticals industry, this endless battle with biofilm in ultra-pure water systems is a daily fact of life. Biofilm establishes itself in ion exchangers for water softening or demineralization systems, can colonize reverse osmosis modules, and — depending on how the system is designed — can even penetrate membranes to reach the permeate side. It then colonizes the walls of the downstream pipes and distribution reservoirs. In distribution reservoirs that are open to the air, the entry of additional bacteria from the surrounding air may also contribute to the development of biofilm. Despite this alien invasion, biofilm in water-supply systems is initially extremely difficult to identify. It is only after the biofilm has grown to such an extent and has reached its stationary phase that it continues to grow without gaining in volume. At this stage, it releases as many bacteria as it can produce through cell division. Only then is a dramatic rise in the bacteria count evident in the water. Disinfection of the water leaves biofilms mainly undisturbed and is unsuitable as an effective preventive measure. Biofilm fragments (bio-envelopes), which are continually released during the stationary phase, are then able to grow on any moist surface in an air-conditioning system (e.g. air humidifiers). Wherever humidity, moisture or standing water are present and no suitable countermeasures are in place, it is inevitable that new biofilms will form, and that the reproduction of bacteria will continue. Therefore, hygienic air humidification is itself a never-ending battle against biofilms as well. Many requirements in the updated VDI 6022 Sheet 1 point in this direction, even though the term “biofilm” is never actually used. For example, sub-section 3.6 stipulates that: “Materials in air circulation zones in which standard operating conditions typically include high relative humidity or water must not become breeding grounds for microorganisms.” Furthermore: “Materials, surface finishes and the geometric forms of equipment components should be designed to prevent adhesion and accumulation of impurities” (VDI 6022, Sheet 1, 4.1.1); and “microbiological growth on surfaces should be avoided as much as possible in air-circulation components and on surfaces that become wet for technological purposes” (VDI 6022 Sheet 1, 4.2). Unfortunately, biofilm can form on almost any surface. Table 1 depicts the range of microbial colonization types seen in biofilms, and indicate the harsh environmental conditions under which biofilms are able to grow. Furthermore, evidence of biofilm has been found in disinfection pipe systems and in other cases has been resistant to freely circulating chlorine at over 2 mg/l. The removal of established biofilm is as tedious as it is tiresome. Every one of us is used to battling biofilm — in the fight against dental plaque. According to VDI 6022 Sheet 1, 4.3.7, an increase in the bacterial count beyond the threshold value of 1000 CFU/ml, i.e. ten times the maximum bacterial count in drinking water, can be prevented by the use of suitable sterilization systems in combination with regular cleaning and drying. However, if biofilm has already established itself in the water supply system, it will likely be highly resistant to a short drying period. The saturated biofilm matrix has absorbed large volumes of water, and is therefore extremely slow to dry out and separate from the surface. Many cleaning systems reach only the uppermost layers of the biofilm. A solid biofilm can only be removed using a mechanical method, and then only with a relatively abrasive cleaning procedure. One useful but relatively Laborious method sometimes used in air humidification systems is the use of a hydroxide alkaline solution to remove the biofilm, followed by a rinse with an acid solution. A somewhat gentler approach involves enzymatic cracking of the EPS matrix and emulsification of the detritus using powerful tensides, followed by disinfection with hydrogen peroxide. Anyone with experience in staffing and scheduling building services can imagine the enthusiasm that this type of cleaning method inspires in the cleaning staff. It is vital to prevent the formation of biofilm right from the start. 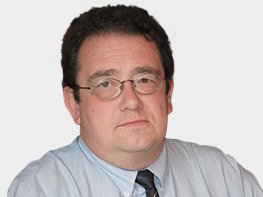 Indeed, stopping biofilm from forming is the key to hygienic humidification. At present, there are only a handful of methods that can reliably prevent the formation of biofilm in the system. Pipe systems under continuous exposure to UV do not yet exist. Other potentially feasible systems are still blocked by patent or copyright law, and therefore cannot be employed. Thus at present the only solution is the use of biofilm blockers (substances that reduce the germ count). VDI 6022 Sheet 1, 4.3.7 permits the disinfection of the humidifier supply and recirculating water using procedures which have been proven effective in practical tests, which do not constitute a health risk and which guarantee that supply air is residue-free. It is this very desire for a residue-free air supply which greatly restricts the number of potential methods and procedures. Nobody wants to breathe in biocides. The product selected must be effective against biofilm or its causes and, before being inhaled, must have degraded or at the very least, have settled out of the air. Therefore only four active substances are feasible at present: ozone, hydrogen peroxide, chlorine dioxide and silver. Ozone and hydrogen peroxide react with bacteria, organic material and oxidizable air pollutants. Depending on the dosage, the cleanliness of the air and the surfaces, it cannot always be guaranteed that ozone and hydrogen peroxide have vented or have been broken down before the air is fed into the air-conditioned rooms. At least when ozone is used, certain residual amounts are acceptable in the air. In natural areas outdoors (mountains, forests, lakes), ozone concentrations ranging from 20 to 30 ppb are common and are experienced as a pleasant phenomenon. If the sun is strong, ozone levels in the air outdoors can also be high and can cause health problems. We are all aware to some extent of ozone warnings during the summer months. According to VDI 2310, the upper concentration limit for ozone in the air is 60 ppb for an exposure time of up to 30 minutes. Therefore an concentration that is effective, without posing any health risk, calls for precise dosing. The effectiveness of chlorine dioxide depends on the dose and the degree of local air contamination. Precise dosing is also an absolute necessity here to prevent inhalation of chlorine dioxide. One benefit of using this oxidizing agent is that it helps to break down airborne contaminants, thereby producing a certain air-cleaning effect. The use of bacterial reduction procedures with an oxidative effect is highly dependent on a sensitive, contamination-dependent measuring, control and dosage technique. The use of ozone, peroxide or chlorine dioxide is only practicable if this dosing technique is reliable. Silver, the precious metal, also shows extremely effective antibacterial properties. However, these properties are not seen in raw sheet silver, silver granulate or on silver-plated ceramic. Silver is only effective as ions or nanometer-sized particles, known as nanosilver. Silver as an antimicrobial substance is characterized by an exceptionally broad spectrum of activity. An article on this subject will feature in a future edition of the journal TAB (Technik am Bau). The current boom in silver-coated surfaces is a result of the rediscovery of silver and the possibility of anchoring reactive silver on surfaces. Applications include refrigerators and cold storage cells with silver-coated surfaces, insoles, and work clothing, and in the medical sector, nanosilver on dressing materials, in specialized wound gels, and on catheters and implants. Silver’s effects are not due to an oxidative destruction of cell membranes, but is rather a result of the selective inactivation of key enzymatic systems. Silver ions bind to the enzyme’s sulfur groups, thereby inactivating them. At just a third of the concentration of silver ions which are needed for inactivation, the bacteria stop multiplying (proliferation inhibition) and are then unable to form biofilm. The goal of preventing biofilm formation is therefore achieved. Silver and preparations containing silver have been used in water treatment systems for a long time. Silver preparations provide disinfection of drinking water for hikers and in mobile homes, are permitted for the conservation of drinking water supplies in rescue boats and life rafts, and are approved for use under the German Drinking Water Regulation. In adiabatic humidification systems which use water that has been treated with silver, the silver ions bind to the cell walls and cell membranes of the bacteria and inactivate their transporter enzyme systems. For effective, problem-free results, the dose must be precisely adapted to the water throughput and humidifier performance. To achieve this, silver ions can be released using an electrolysis unit right at the place of use (air humidifier). In this way, the silver ions can be dosed precisely and sensitively, and then be removed again from the air and water using the appropriate separator surfaces (e.g. ceramic). Micro-organisms which also appear on these ceramic surfaces are then sprayed with humidifying water which contains silver. The ceramic is also enriched with silver through the evaporation of the water. As a result, the micro-organisms are thoroughly infused with silver and inactivated. Bacteria which enter via the air stream are also captured and eliminated. These conditions make it extremely difficult for biofilm to form. Due to the depositing of silver ions on these types of ceramic surfaces, only a vanishingly small proportion of silver can be detected in the humidified air. As a result, the requirement of residue-free supply air as specified in VDI 6022 Sheet 1, 4.3.7 is also fulfilled. The battle against biofilm is worth the effort — and victory is possible!